A patient of twin to twin transfusion syndrome presented in early second trimester with intrauterine fetal death of one of the twins. Pregnancy could be continued till 32 weeks with monitoring of the coagulation profile and ultrasound (USG). A good perinatal outcome was achieved for the surviving twin. This case highlights the fact that individualization of treatment during ANC period does lead to good neonatal outcome in the surviving twin. Intrauterine fetal death (IUFD) of one twin in a case of twin to twin transfusion syndrome (TTTS) is relatively common and known complication of twin gestation. TTTS is a major cause of perinatal morbidity and mortality when complicated by death of one twin. Surviving twin is at risk of prematurity and also neonatal death. [2, 3] Expectant management can be given in cases of severe prematurity until fetal lung maturation occurs with strict monitoring. A 23 yr old primigravida presented in emergency with USG diagnosis of a monochorionic diamniotic twin with twin to twin transfusion syndrome with 23 weeks of gestation age and IUFD of one twin. She had an earlier USG scan of 18 weeks of gestation which showed presence of cardiac activity in both twins, the biometry showed a lag of 3 weeks between the twins. USG Doppler done had diagnosed twin to twin transfusion signals in a monochorionic diamniotic placentation. On presentation the couple expressed a desire to salvage the surviving twin after all risks to the mother and the surviving twin with continuing the pregnancy were explained. She was admitted, given bed rest in the left lateral position and pregnancy was monitored with biochemical, hematological and serological parameters. On obstetric USG polyhydramnios in the surviving twin was detected, the amniotic fluid index (AFI) being 32 cm at 23 weeks of pregnancy. Maternal fasting and postprandial blood sugars were normal. Obstetric USG showed no congenital malformation. Oral indomethacin was given for 48 hours and was stopped as the AFI reduced to 27 cm. Fetal 2D ECHO was done which was normal. Serial monitoring of CBC with platelets, coagulation profile, and obstetric USG and doppler were the focus of her antenatal monitoring. The biometry on serial USG showed no growth retardation in the live twin. Fetoplacental and uteroplacental pulsatility index (PI) on Doppler were also normal. Middle cerebral artery Doppler studies of the surviving twin was within range for the gestational age. She was given prophylactic steroids as intramuscular dexamethasone 6 mg 12 hourly 4 doses to achieve fetal lung maturity at 28 weeks of gestation as she was predisposed to preterm labor which eventually did occur. The patient took discharge on request on day 53 of admission (32 weeks of gestation). She returned within 8 days of discharge on day 61 at 33 weeks of gestation in advanced preterm labor. She delivered the first live born male twin baby weighing 1.55 kg and second twin, a macerated male abortus of 365 gm. APGAR score live born was 9/10 at 1 minute and also at 5 minutes. Surprisingly, the amniotic fluid volume in the live born twin was normal and the polyhydramnios was seen in the amniotic sac of the dead twin. Placenta on gross inspection was monochorionic, diamniotic. The neonate stayed in NICU for a month and was then discharged. The neonate showed no signs of disseminated intravascular coagulopathy and cerebral impairment either clinically or on post delivery investigation by the coagulation profile and USG of the brain respectively. Figure 2. Live premature twin. The RCOG study on multiple pregnancies with death of a co-twin recommends that the management should depend on chorionicity, gestation and time since death. They recommend policy of increased surveillance with delivery at 37 weeks in dichorionic pregnancies. According to ACOG guidelines it is recommended that if the death is the result of fetal anomaly itself rather than maternal or uteroplacental pathology and the pregnancy is remote from term then expectant management may be suitable. About 10-15% of monochorionic pregnancies are complicates by TTTS as the placentas are more likely to have unidirectional artery-vein communication. This anastomosis results in hypovolemia in the donor twin and circulatory overload in the recipient twin. Thus the donor twin is anemic whereas the recipient is polycythemic. Polyuria due to circulatory overload in the recipient twin leads to polyhydramnios and hypovolemia in the donor twin results in a growth restricted fetus and oligohydramnios in their respective amniotic sacs. After the single fetal death in a monochorionic pregnancy the risk to the surviving twin of death or neurological abnormality is of the order of 12% and 18% respectively. There were a few unique features in our case. We were able to continue the pregnancy for 61 days after the co twin demise so pregnancy progressed from 23 weeks to 33 weeks whereas in an international study, median interval between the diagnosis of fetal death and the delivery was only 11 days. Our patient took home a healthy neonate whose Apgar scores were 9/10 both at 1 minute and 5 minutes and birth weight was 1.55 kg. The live twin birth was followed by the stillborn twin. The interesting feature was the polyhydramnios in the stillborn’s amniotic sac that was contradictory to the USG finding. As the fetus ceases to produce urine after death we postulate that this twin was the recipient and circulatory overload was the cause of its demise. However, the reduction of AFI with a short course of indomethacin is unexplainable as indomethacin which is a prostaglandin inhibitor works by decreasing the urine output. Risk of coagulopathies and thromboembolic phenomenon are reported in the surviving co-twin in its intrauterine environment due to vascular anastomosis. It is postulated that the thromoplastin from the dead twin enters the surviving twin’s circulation and induces coagulopathy. Close monitoring of the surviving twin was done with the aim to detect onset of any coagulopathy and to detect any dense echoes in the fetal brain as the reported incidence of cerebral impairment in the surviving twin in a TTTs is about 20%. MRI to detect the extent of cerebral lesions in the neonate is usually not needed. In case of growth restriction in the surviving twin MCA PI is useful for monitoring monochorionic twin pregnancies. Literature search recommends a complete evaluation of the live twin neonate with the aim to detect anaemia, polycythemia, thrombocytopenia, abnormal renal and hepatic functions, fluctuation in blood sugar levels and presence of hypocalcemia. Imaging studies recommended include USG evaluation of the brain, abdomen, kidneys, echocardiography and chest radiograph. [10,11] The neonate was thoroughly evaluated and observed by the neonatologist for a month. No functional or structural abnormality was detected in our twin. Expectant management can be given to case of TTTs with co-twin death with strict antenatal, hematological, biochemical and USG monitoring until fetal lung maturation occurs. Chelli D, Methni A, Boudaya F, Marzouki Y, Zouaoui B, Jabnoun S, et al. Twin pregnancy with single fetal death: etiology, management and outcome. J Gynecol Obstet Biol Reprod (Paris). 2009;38(7):580-7. Aslan H, Gul A, Cebeci A, Polat I, Ceylan Y. 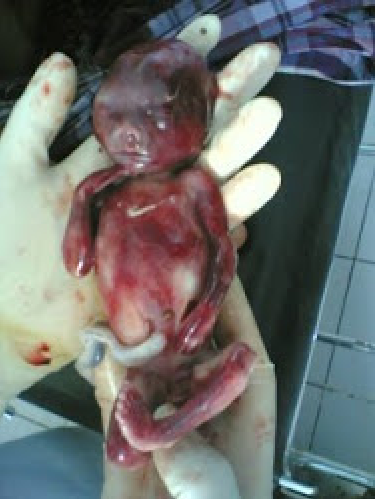 The outcome of twin pregnancies complicated by single fetal death after 20 weeks of gestation. Twin Res. 2004;7:1-4. Browne I, Brustman L, Santos A. Intrauterine Fetal Death. In: Datta S, ed. Anesthetic and Obstetric Management of High-Risk Pregnancy. 3rd ed. New York: Springer publications. 2003. pp 515-28. Kilby M, Baker P, Critchley H, Field D, editors. Multiple pregnancy. London: RCOG Press; 2006, 283-6. American College of Obstetricians and Gynecologists (ACOG). Multifetal gestation: complicated twin, triplet, and high-order multifetal pregnancy. Washington (DC): American College of Obstetricians and Gynecologists (ACOG); 2004 Oct. p. 14-16 (ACOG practice bulletin; no. 144). Royal College of Obstetricians and Gynecologists. Greentop Guidelines number 51. Management of monochorionic twin pregnancy. Edition 1. December 2008. Benirschke K. Intrauterine death of a twin: mechanisms, implications for surviving twin, and placental pathology. Semin Diagn Pathol. 1993 Aug; 10(3):222-31. Pharoah PO, Adi Y. Consequences of in-utero death in a twin pregnancy. Lancet 2000 May 6; 355(9215):1597-602. Suzuki S, Sawa R, Yoneyama Y, Otsubo Y, Araki T.Fetal middle cerebral artery Doppler waveforms in twin-twin transfusion syndrome. Gynecol Obstet Invest. 1999; 48(4):237-40. Sallam MAG. Twin-to-twin transfusion syndrome (TTTS). Ain Shams Journal of Anesthesiology. 2011 Jan; Vol 4-1: 99-104.